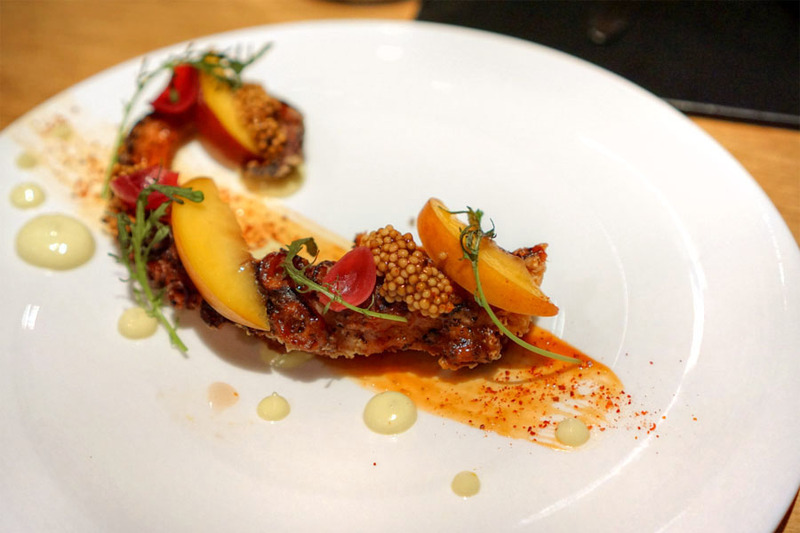 July 15th marked the debut of 71Above, which apparently has the honor of being the highest (above ground level) restaurant in the country, "west of the Mississippi" of course. 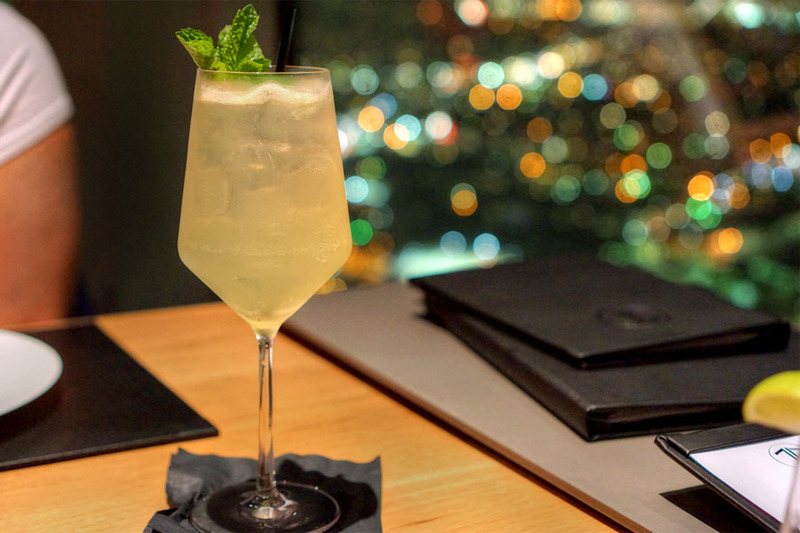 Situated roughly 950 feet above the street on the 71st floor of Downtown's U.S. Bank Tower, the place is the work of Emil Eyvazoff, the man behind fellow high up eatery Takami Sushi/Elevate Lounge. 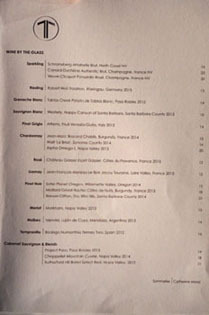 71Above features the cooking of Chef/Partner Vartan Abgaryan, whom I last encountered at Test Kitchen in 2010. Back then, he was working at Tim Goodell's A Restaurant in Newport Beach, but ended up running Goodell's Public Kitchen & Bar at The Hollywood Roosevelt Hotel not long after. Abgaryan's next move came in October 2012, when he took over the Executive Chef position at Cliff's Edge from Ben Bailly. He began making a name for himself at the Silver Lake restaurant, but left to work on 71Above last October, replaced by Gavin Humes (Sadie, Inn of the Seventh Ray, Raphael). Joining Abgaryan are some familiar faces. Chef de Cuisine duties are handled by Jon Butler, a Manzke protégé who's worked at République, Fig, Le Saint Amour, and Church & State. 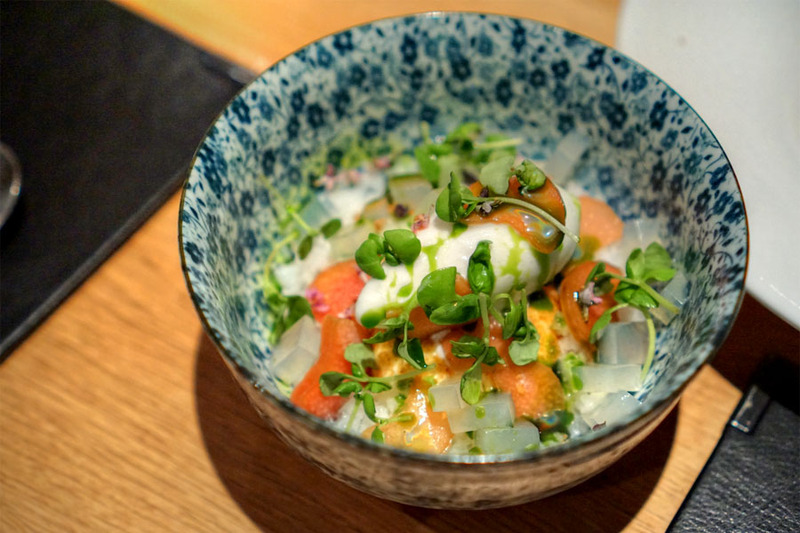 We also have Derrick de Jesus, who first popped up on our radar at the original incarnation of Alma and was recently head chef at Barrel Down; Matthew Kim from Mozza and Grant Achatz's Next in Chicago; and Susan Yoon, who comes to us from Josef Centeno's Orsa & Winston and Bäco Mercat. 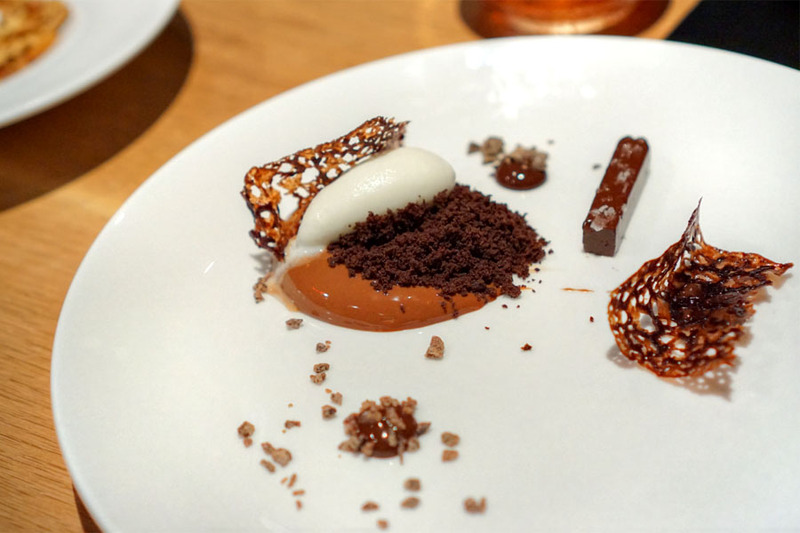 The Pastry Chef is Gregory Baumgartner (Spring, E.P. 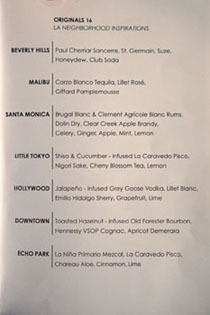 & L.P., Bourbon Steak), while the GM role is taken by Alex Hasbany (The Palm Beverly Hills and Downtown, as well as a number of places in New York). 71Above was penned by Tag Front (Eyvazoff's other spots, as well as Triple 8, Le Ka, and Boa). It's a handsome, contemporary space, with 360-degree views and an open kitchen, naturally. The restaurant's actually divided into a number of sections--Bar, Dining Room, Chef's Table (facing the kitchen), Semi-Private Dining that can be partially converted to Private Dining, SkyLounge--and curiously, you can only guarantee a view if you purchase a table in advance via Tock (versus getting a standard reservation). 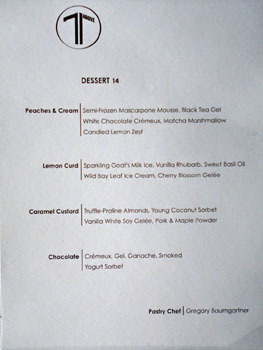 As for the menu, it's a three-course prix fixe at $70 a head (you're surely paying a premium for the location), plus $45 for wine, and you can also add on supplemental courses; no dessert is included though. 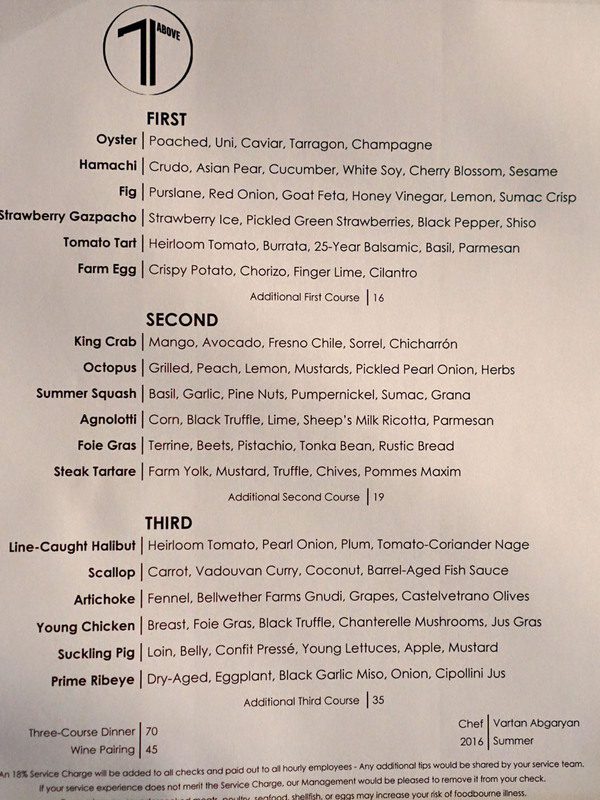 There's also a two-course lunch option, and an abbreviated bar menu. 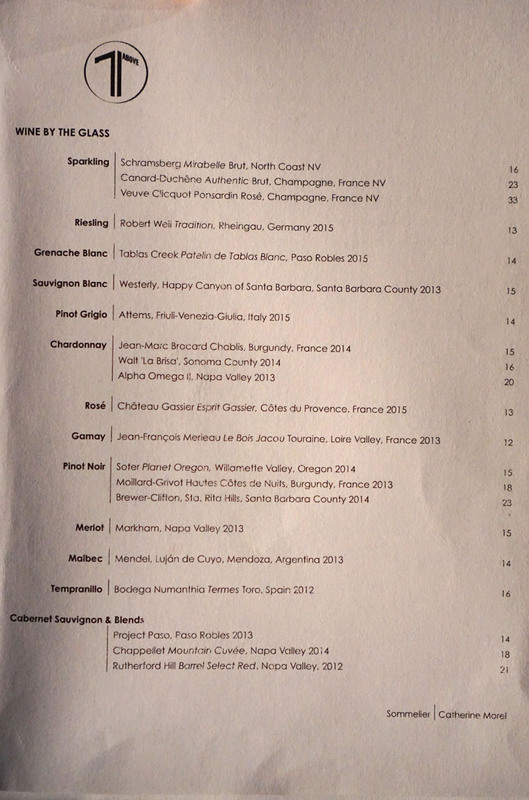 In terms of wine, you get a pretty healthily-sized, global list put together by MS Reggie Narito and managed day-to-day by Sommelier Catherine Morel (Bourbon Steak, American Fish and Sirio in Vegas). 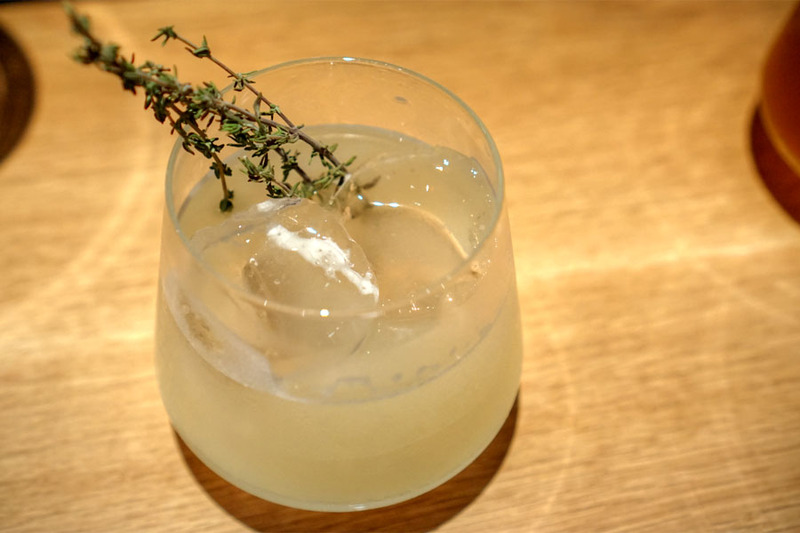 Though the cocktail program was originally supposed to be run by Proprietors LLC, it's currently the task of Darwin Manahan, formerly of Osso, Cliff's Edge, and Corazon y Miel. 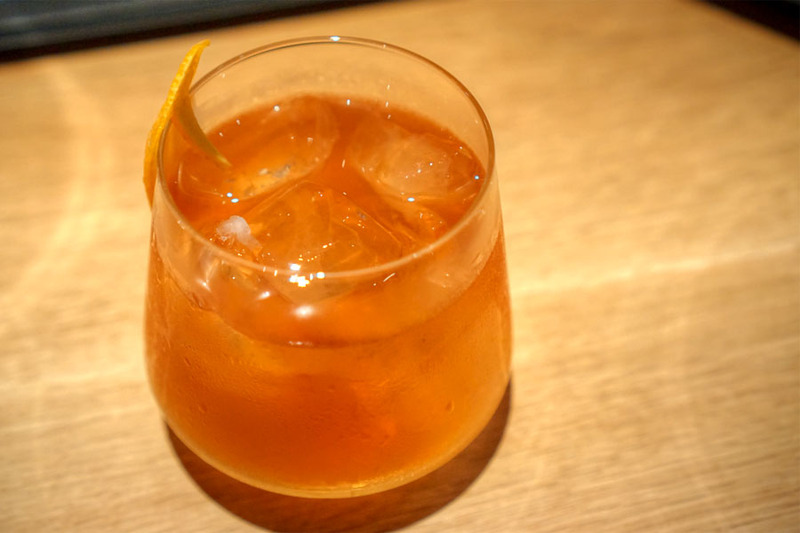 Selections are split between classically-leaning and more novel creations inspired by the various neighborhoods of LA. 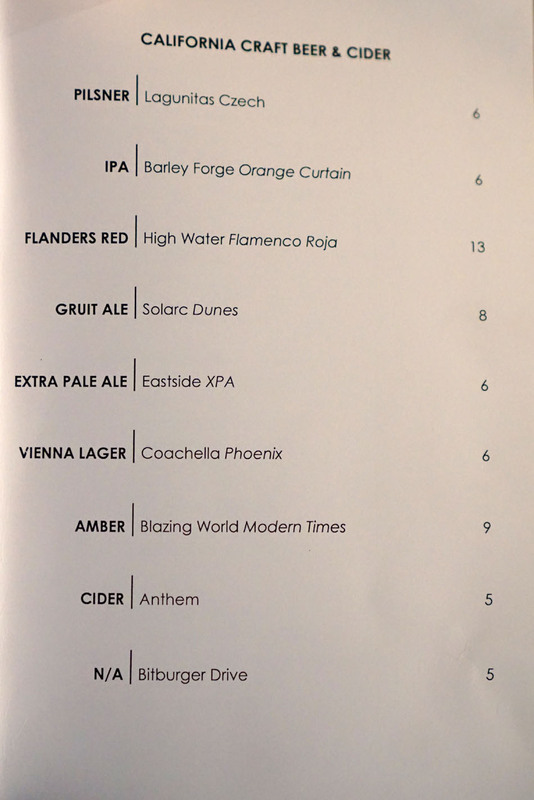 Beer's an option too. Click for larger versions. 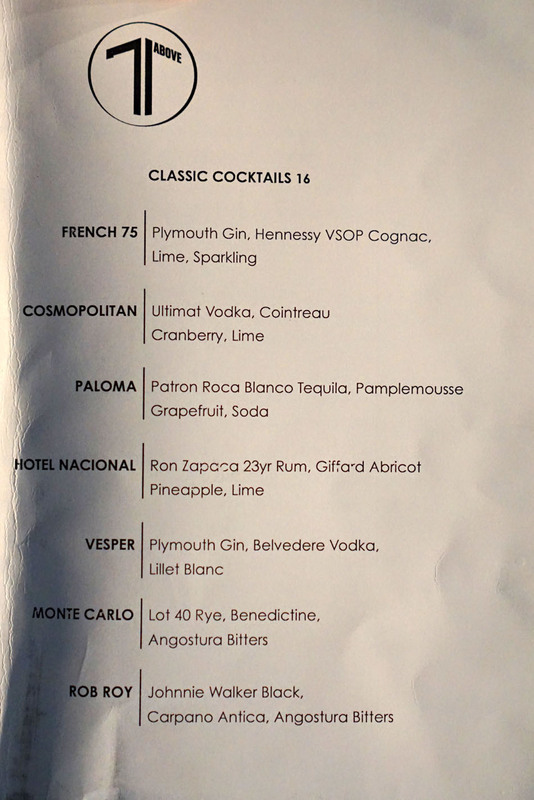 We decided to go all-cocktail this evening, and as usual, I headed straight toward the one with mezcal. 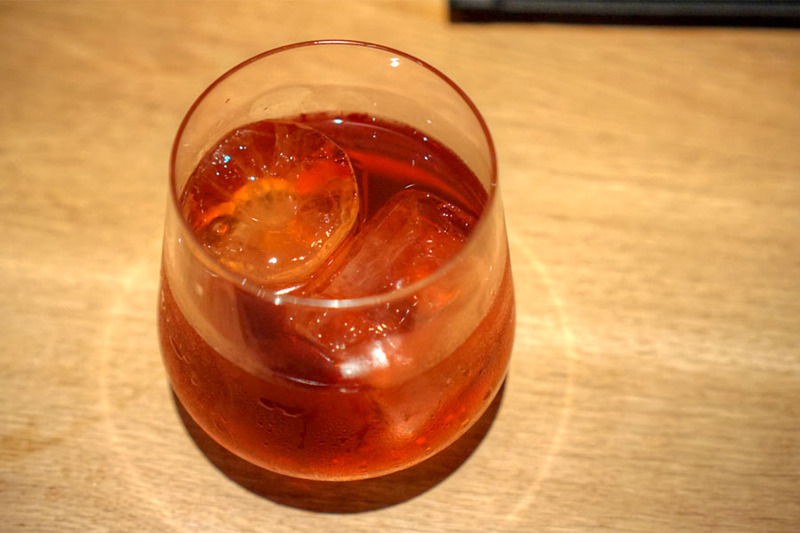 Unexpectedly, it was likely the mildest mezcal-containing drink I've had, displaying far more sweet and herby than smoky. 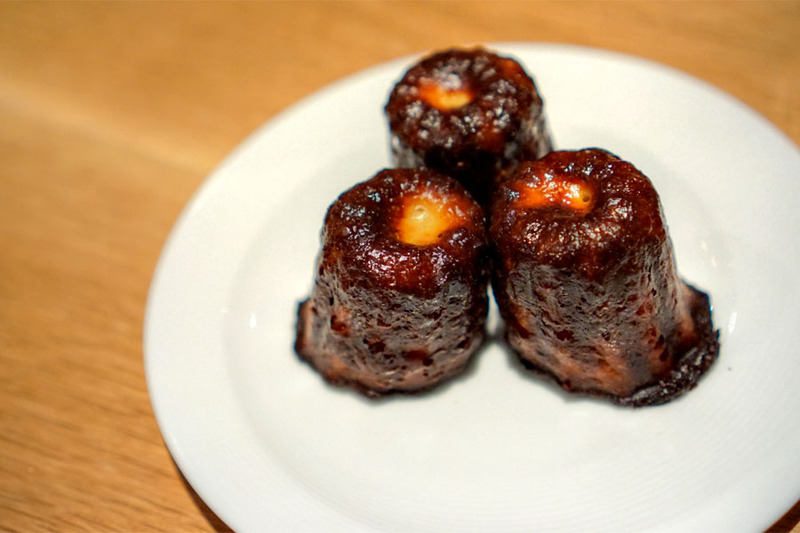 Amuse bouche duties were taken care of by Pecorino-rosemary-garlic canelés. They were wonderful two-biters: caramelized on the outside, but fluffy and cheesy on the inside. Our meal proper began with a complementary presentation of oysters. Think creamy and sweet, intertwined with a lingering brine and further pops of salinity from the caviar. 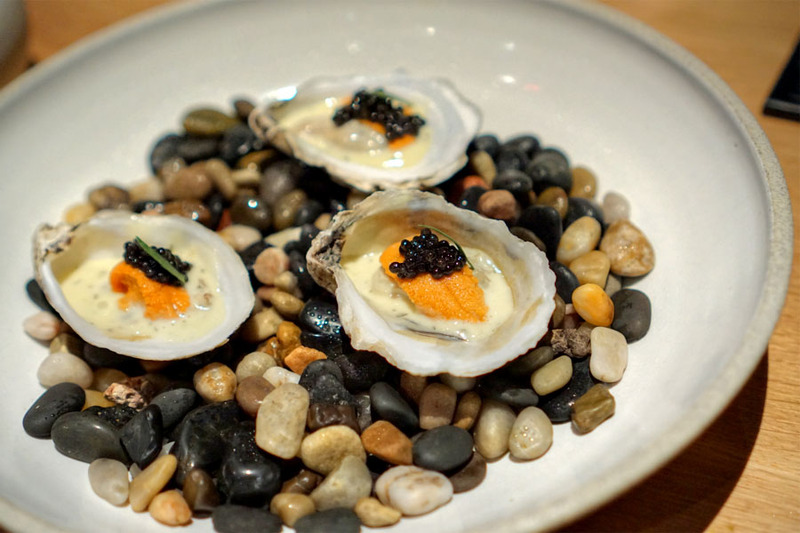 A little reminiscent of Keller's iconic "Oysters & Pearls" taste-wise, actually. 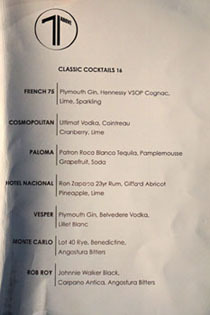 The next cocktail was heftier. Nose was of citrus and sweet, apple-like notes, while the taste went rich, sugary, and decidedly spicy, with a boozy undercurrent to it. The combo of fig and creamy, tangy goat cheese definitely made sense here. 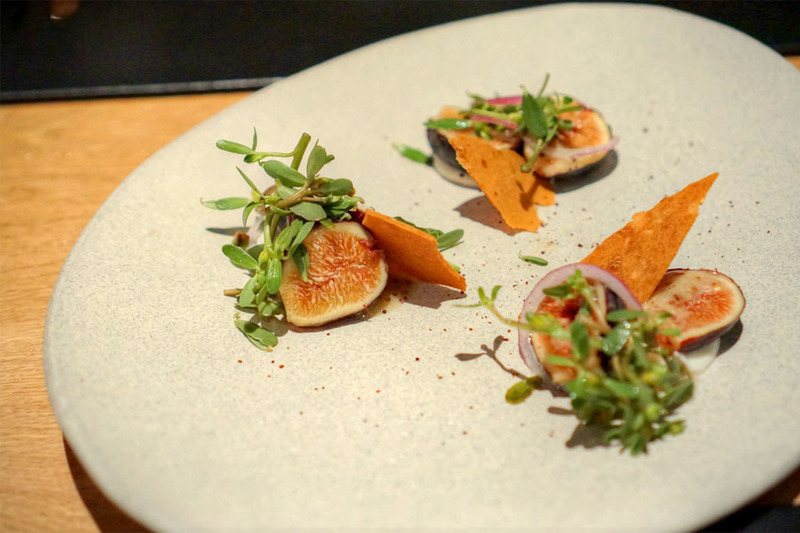 The key, though, was the purslane, which provided a sourness that really lifted the dish. Nice texture from the sumac crisps, too. 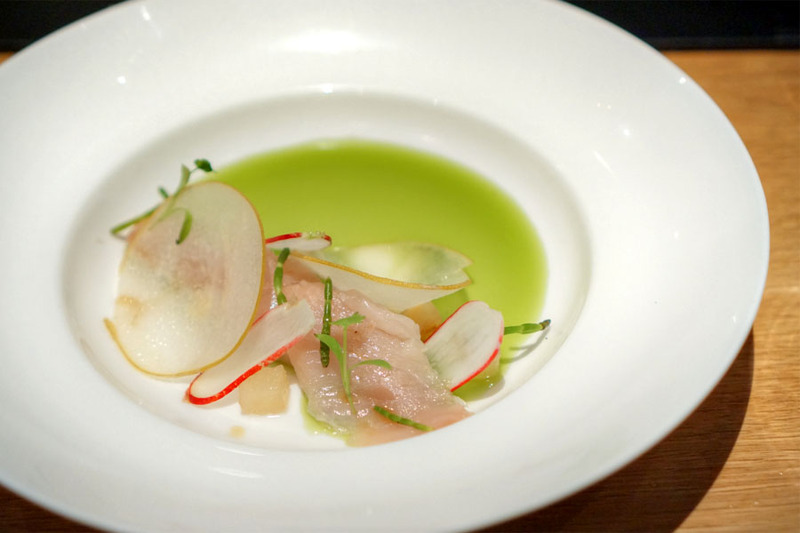 Yellowtail was fatty and soft, enriched by rich umami notes from the soy while nashi pear and cucumber contributed the necessary brightness and crunch. 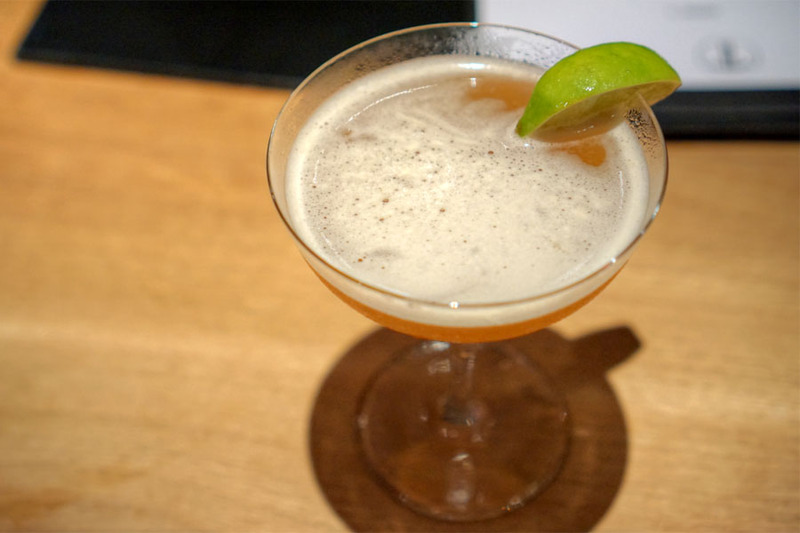 I found this cocktail bitter, almost vegetal at first blush, but then a sort of sweetness came in, joined on the finish by the heat of jalapeño. One of my favorites was this breakfast-y dish, a creamy, luscious mélange of potato and spicy chorizo moderated by the cilantro at the bottom of the bowl. 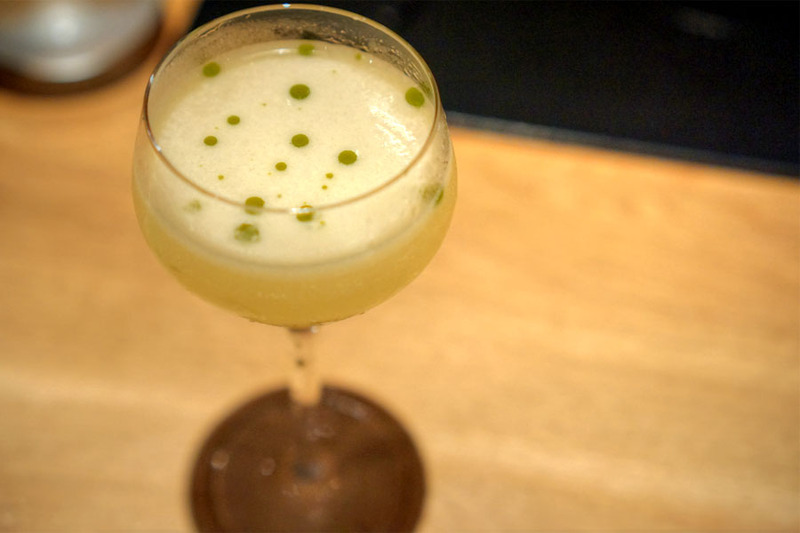 Great pops of acidity from the finger lime, too. 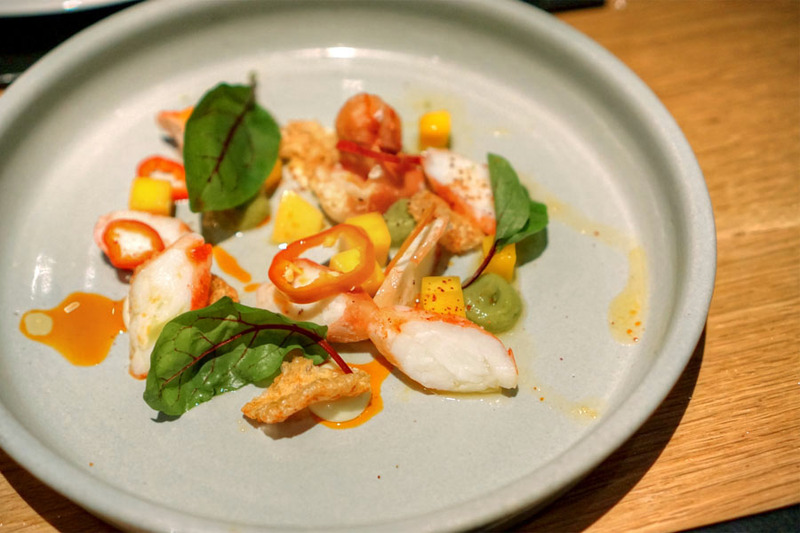 Supple slices of king crab had their natural sweetness augmented by cubes of mango, the chicharrones adding a wonderful touch of salt and crunch to the mix. Lovely kick of heat from the peppers on the back end to boot. 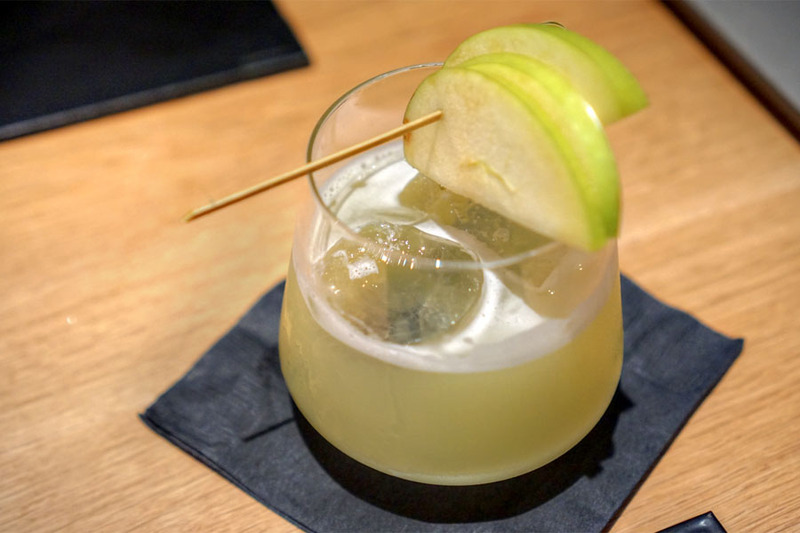 This SaMo-inspired cocktail was all about a fruity, apple-fueled sweetness at the start, but had a distinct vegetal, celery-esque flavor profile that came in later and lasted. The octo was another highlight. 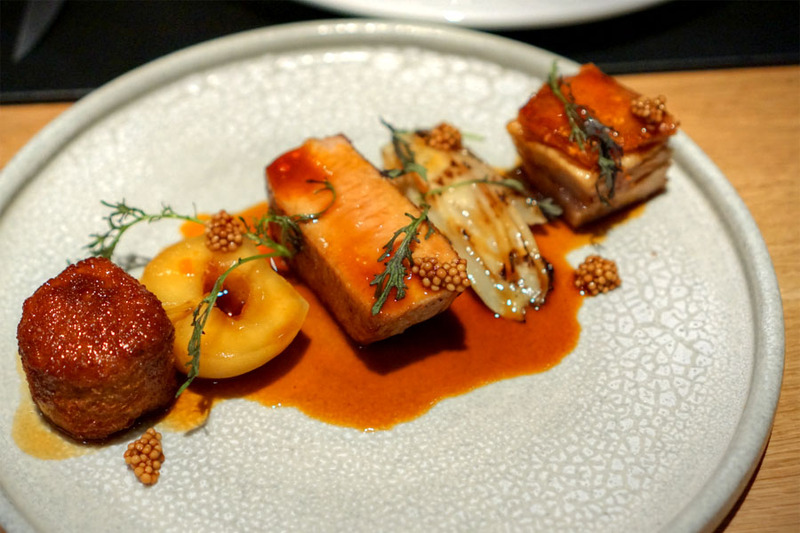 I loved the char and crispness on the tentacle as well as its tenderness, while taste-wise, it showed off a sweet savoriness perked up by the mustard. 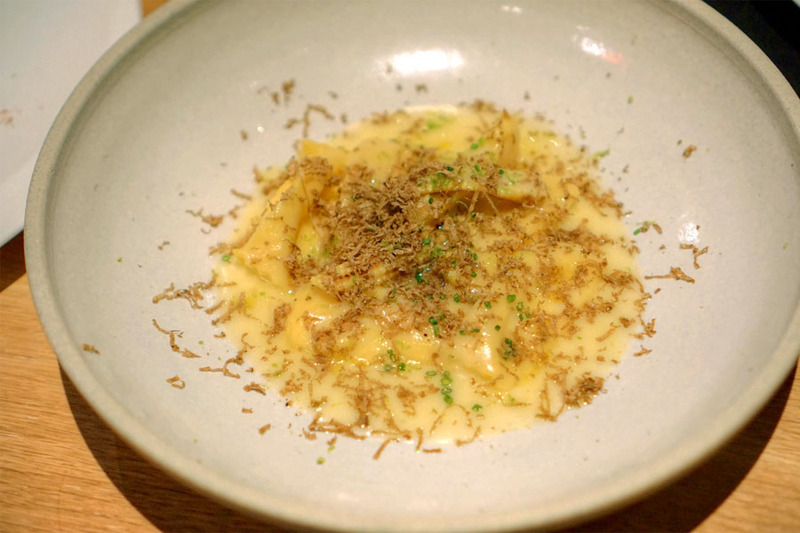 Agnolotti did a nice job playing the natural sweetness of corn against the musk of black truffle, with the lime providing just a bit of punchiness to the dish. 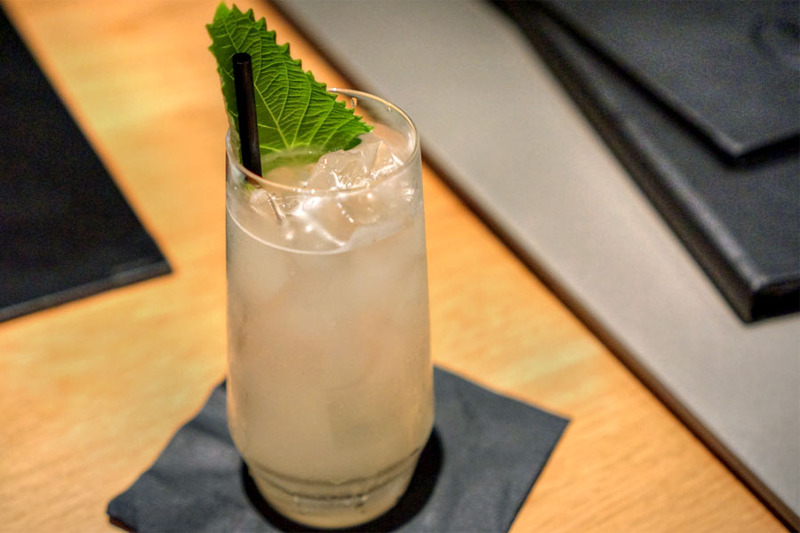 Not surprisingly, the BH cocktail veered soft and sweet, with plenty of floral, fruity flavors and nary a trace of booziness. Definitely a poolside quaffer befitting of its moniker. 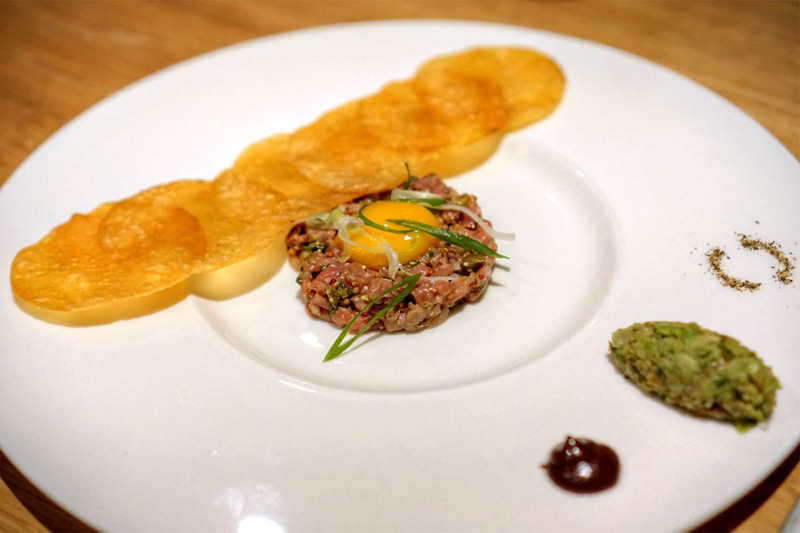 Steak tartar is usually a staple order for us, and the example tonight ate fairly classically. 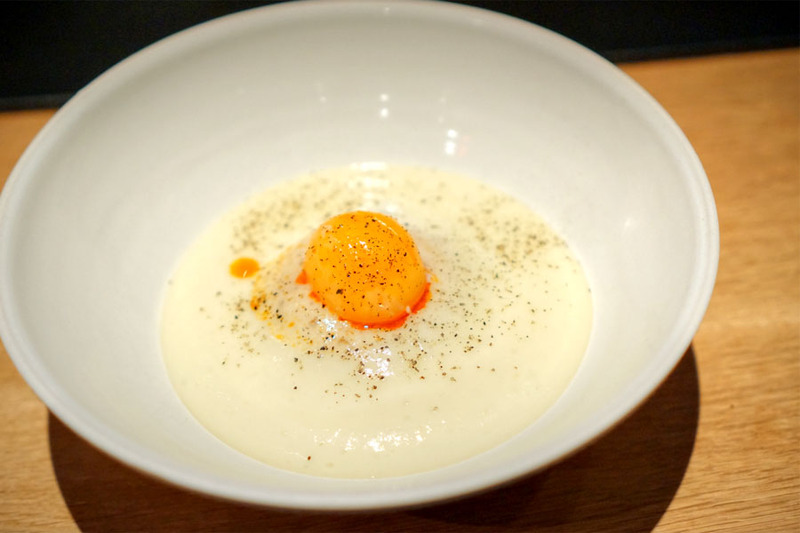 I got a great springiness and bite to the meat, which was complemented by both rich yolk and tart mustard, while the potatoes contributed both salt and texture. 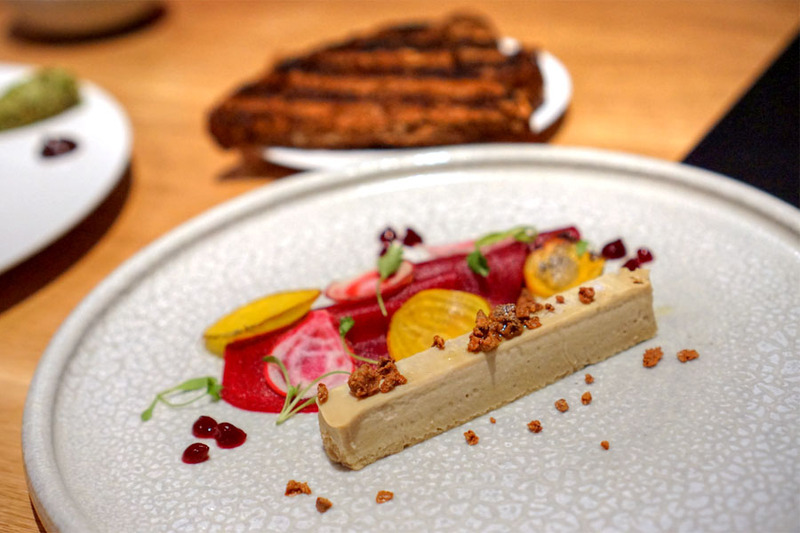 The foie was a must try for us. The terrine itself I found sweet and earthy, with its livery qualities well-balanced by the tanginess of the accompanying beet. Excellent when taken with the super smoky bread on the side. This was another easy-drinker, showcasing plenty of sweet, pear-like flavors alongside herby, bright, tea-like notes. 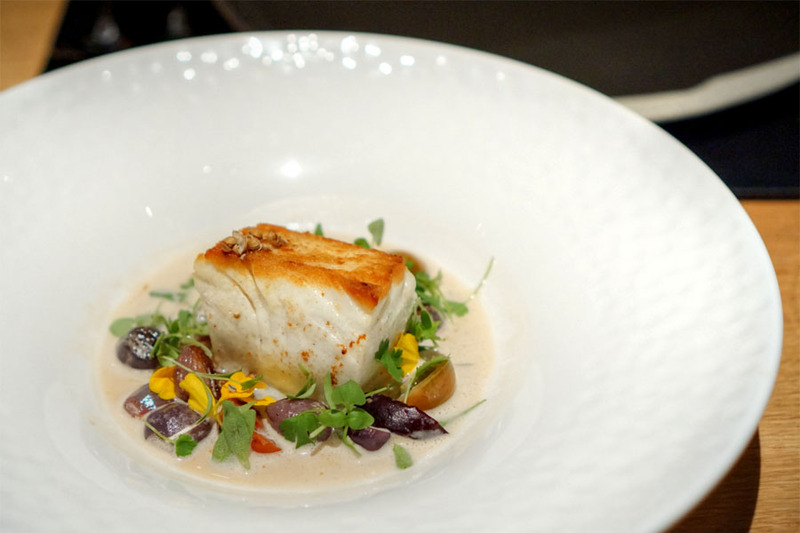 In the first of our mains, a block of halibut came out dense, soft, and well-flaked, its mild brine complemented by the slight sweetness of the nage while the veggies gave a necessary contrast. 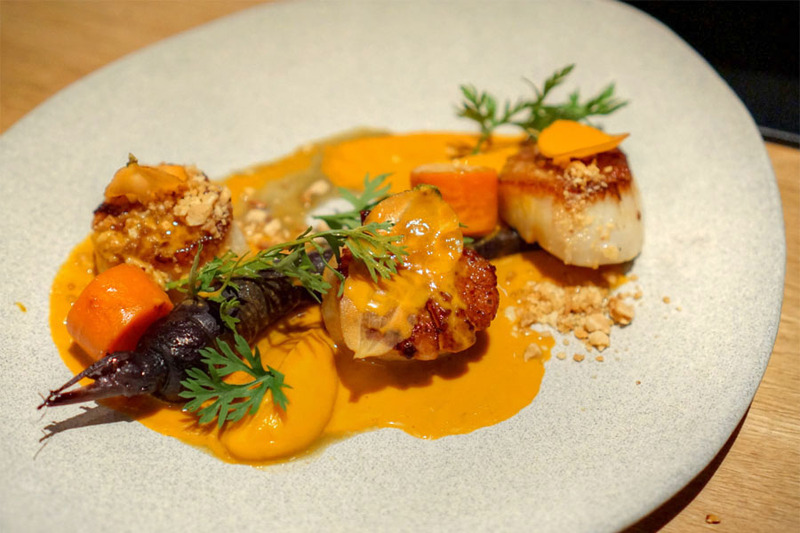 Scallops were perfectly textured, properly caramelized, and conveyed their trademark sweet brine. I appreciated the vadouvan here, which managed to complement the scallops without overwhelming them as I was afraid they might. Our final SoCal-inspired cocktail had a candied nose reminiscent of Jolly Ranchers, interestingly enough. The palate, meanwhile, was creamy, sweet, and spicy, with a touch of counterbalancing tartness to it. 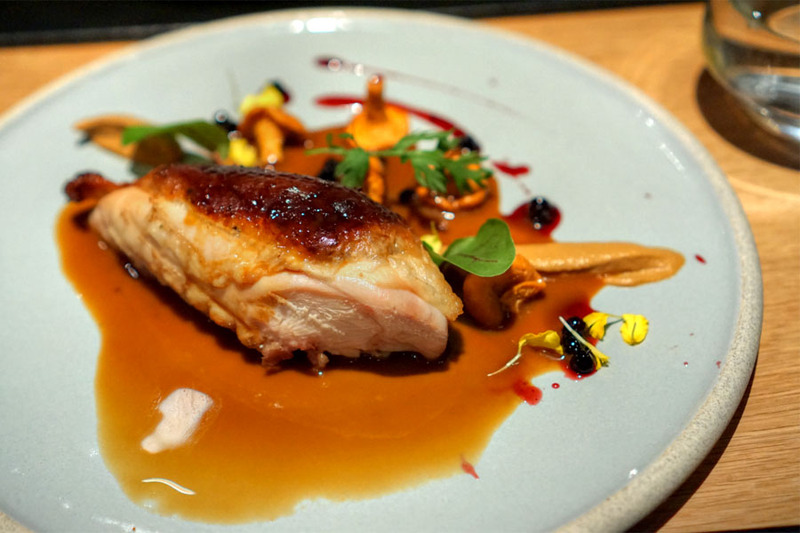 Chicken made sense with accoutrements of foie gras and truffle, not to mention the earthiness of those chanterelles, and I liked the crispiness of the skin. I did find that the end pieces were a bit tough, though. Pork arrived in three variations. The belly displayed a deft balance of lean and fat, along with crisp skin and loads of flavor. The loin was much more restrained, refined in its porkiness, though on the dry side. My favorite preparation was the confit, a super rich, super tender fritter that went swimmingly with the bitter lettuce and a dash of mustard. 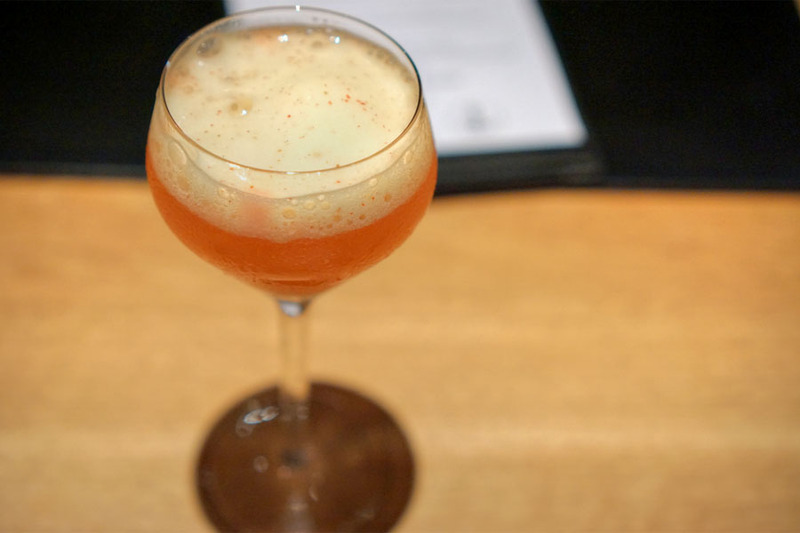 Our sole cocktail from the classics list had an utterly fruit, candied bouquet that reminded us of peach rings. Its taste was a bit more serious though, with a balance between the weight of the rum and sweeter notes of stone fruit. 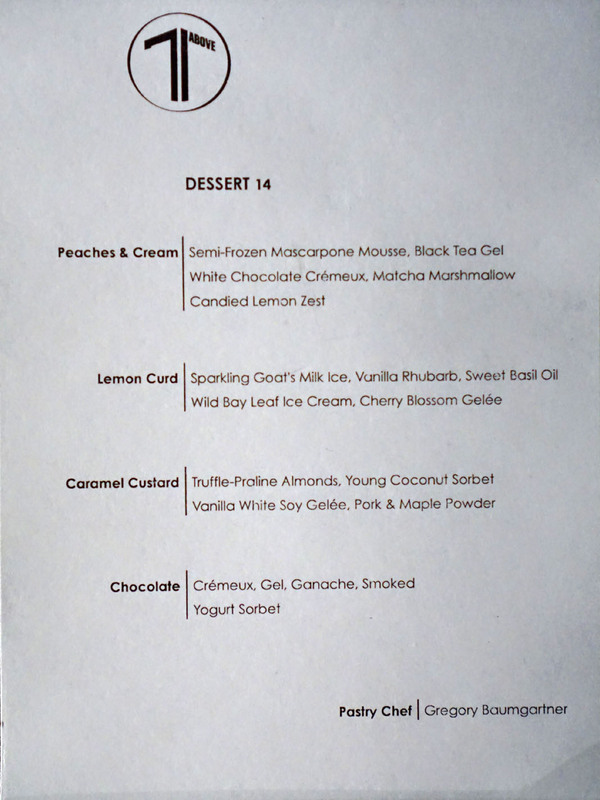 Baumgartner's desserts aren't included in the prix fixe, but are instead available separately. Click for a larger version. 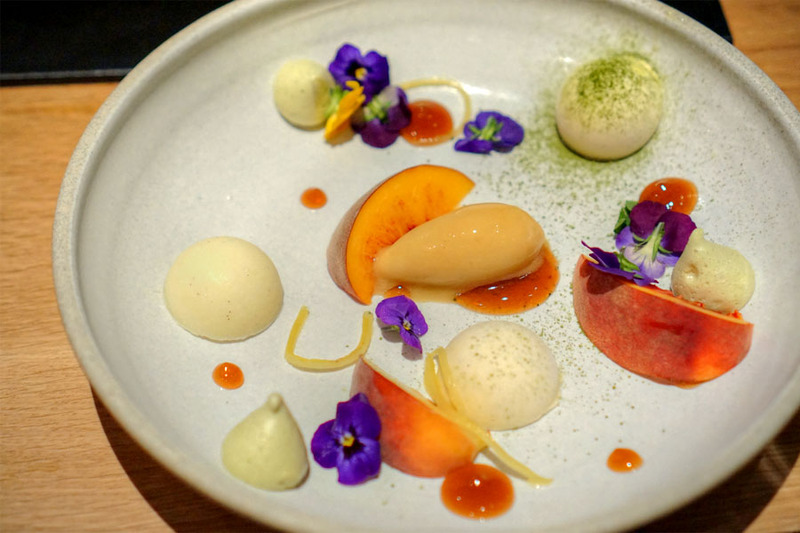 Our first dessert matched the fruity flavors of peach and peach sorbet against various forms of "cream," with a welcomed savory note underpinning the whole dish. 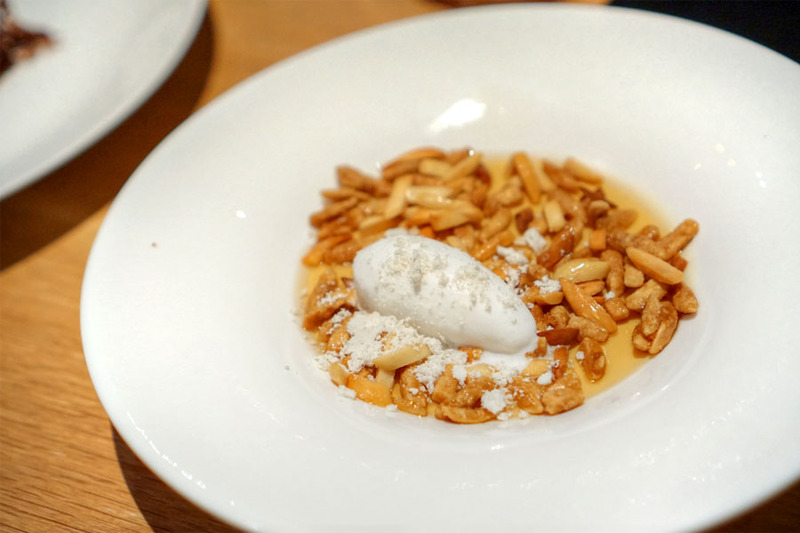 My favorite of the desserts married an unabashedly rich caramel custard with an airy sorbet, sweet-nutty almonds, and a hint of smoke from the pork powder. 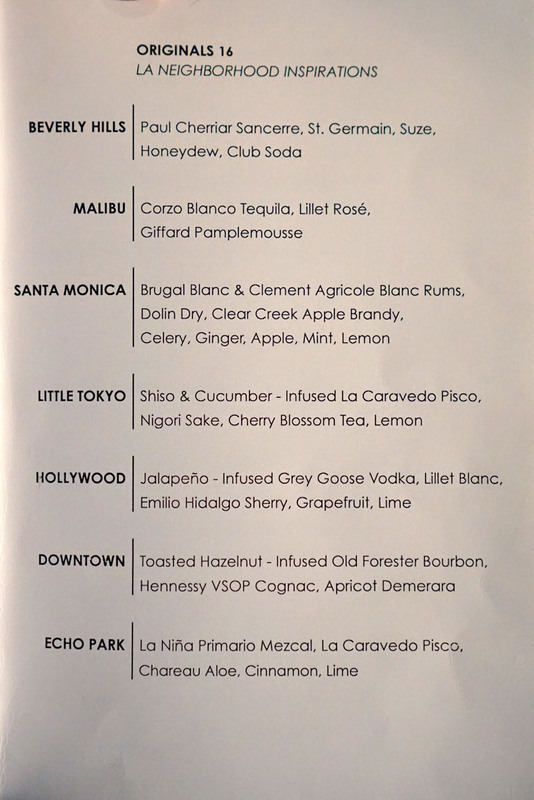 For our final cocktail, we requested this classic from the bar, and they managed to deliver. 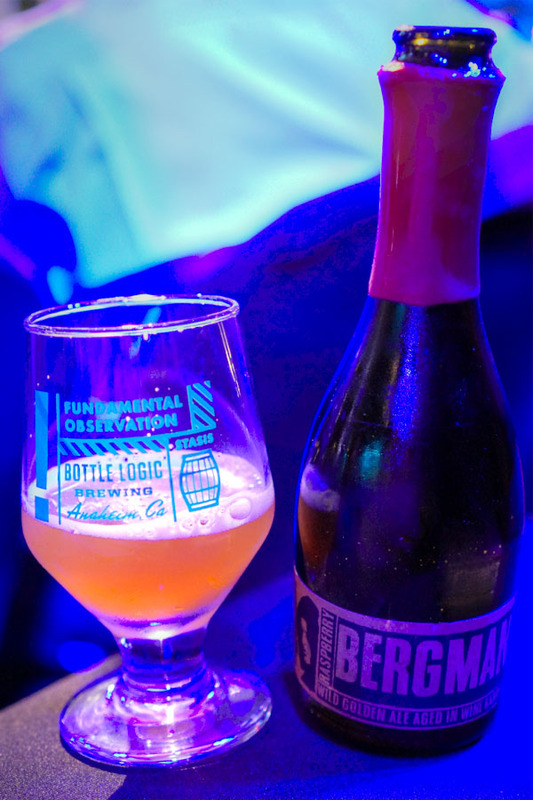 I found bittersweet, citrusy aromas leading to potent, boozy flavors, the Cognac particularly apparent and the finish conveying a welcomed sweetness. This was the most cerebral of the desserts thanks to its distinctly herbaceous, savory flavors layered over a base of tangy lemon curd. The kitchen then sent out a chocolate dessert to end things with. Think sweet of course, but balanced by salt, in a multitude of textures, with the yogurt serving as a contrast. 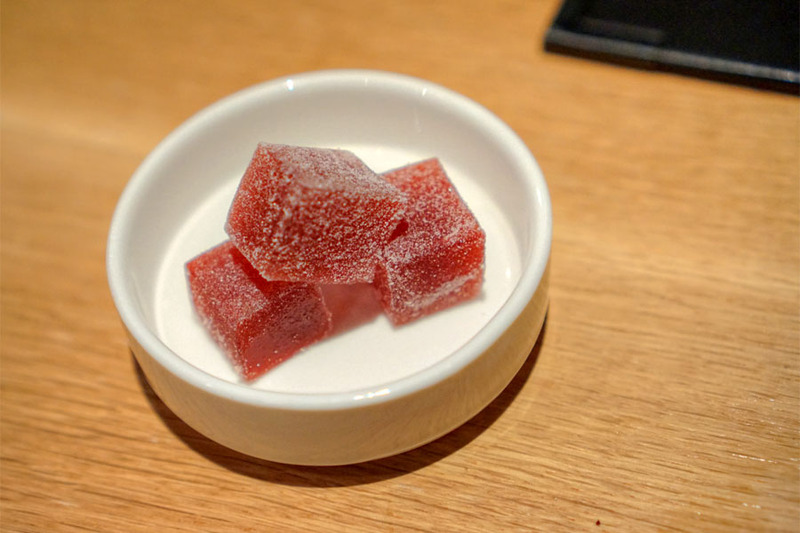 Finally, fig pâtes de fruits. We all know what they say about the food at restaurants with a view, but fortunately, that old adage didn't hold true tonight. Abgaryan's cooking has certainly evolved for the better I felt, and managed to exceed our expectations for sure. Come here for both the vistas and the victuals. 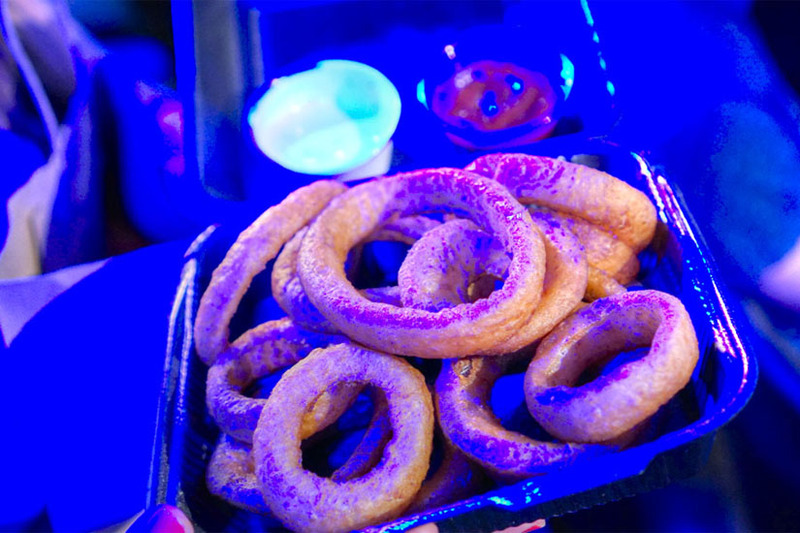 Following dinner, we headed down to the Bicycle Hotel & Casino in Bell Gardens, as we were all invited to attend the final televised table of the WPT Legends of Poker tournament. Players Pat Lyons, Benjamin Zamani, and Upeshka De Silva had been playing three-handed for hours prior to our arrival, but apparently we timed our entrance just right. A few hands in, De Silva called Lyons' pre-flop all-in with pocket jacks and was looking pretty good until Lyons caught a queen on the river, thus making it a heads-up game. Apparently, audience members are encouraged to drink (makes for better television when we get rowdy I suppose), so of course we obliged. 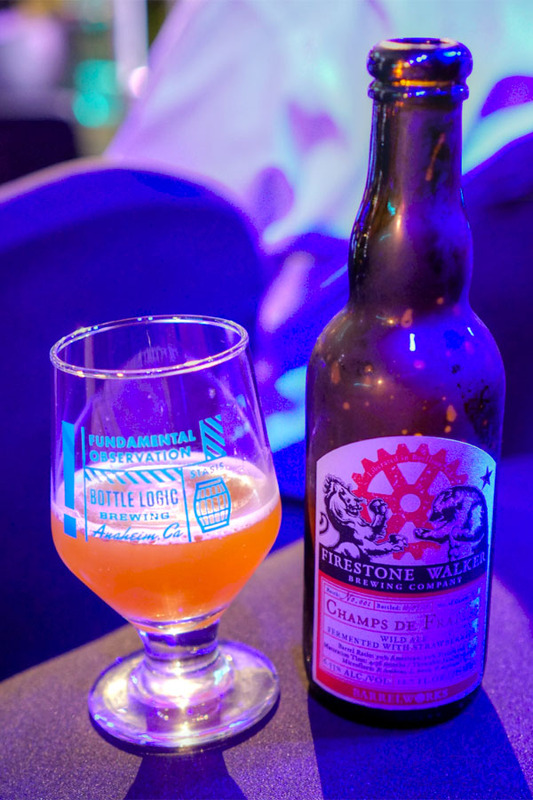 2015 Firestone Walker Champs de Fraises: A blend of Brett-, Lacto-, and Pedio-infused wheat beers aged 4 to 36 months in 50% French and 50% American oak barrels, with Oregon strawberries added. Expectedly tart and funky nose with overlays of strawberry throughout. On the palate: acid, tart, earthy, with the sweetness of the fruit becoming apparent toward the back end. 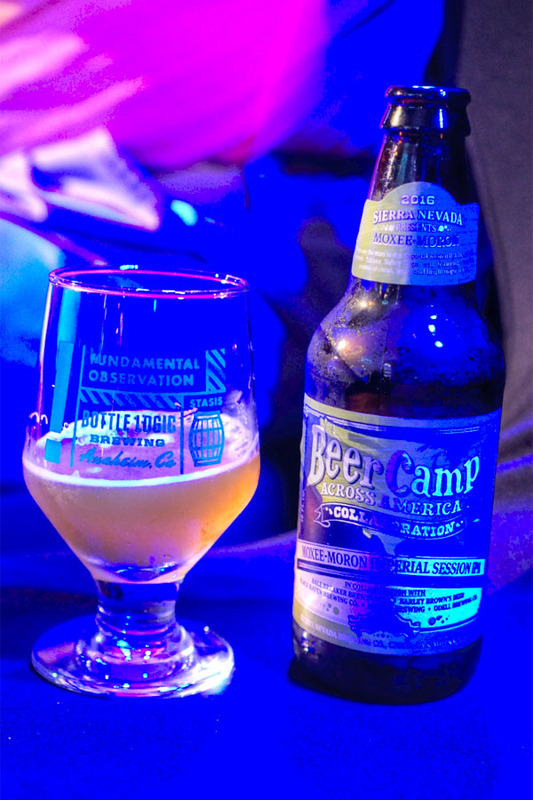 2016 Sierra Nevada Beer Camp Across America - Moxee-Moron: Meant to honor the Yakima Valley hop growing region, this was an imperial session IPA brewed in collaboration with Bale Breaker Brewing Co, Barley Brown's Beer, Black Raven Brewing Co, Melvin Brewing, and Odell Brewing Co. It smelled quite musky, with lots of bitterness and a bit of citrus peeking through. Taste-wise, I got bitter, medicinal hops all over the place, with a malt backing just under the surface. Not a huge fan of this one. 2016 Phantom Carriage Raspberry Bergman: A golden sour ale aged in red wine barrels with raspberries. Bouquet here was noticeably musty, and not in a good way, with a touch of fruit. In terms of taste, I found it tart, vegetal, with an off-putting astringency and more stone fruit than raspberry. A letdown. Rumour is that Lyons and Zamani agreed to chop the pot, so heads-up play didn't last very long. After a flurry of hasty all-ins, Lyons ended up winning with the dead man's hand (ace-eight). 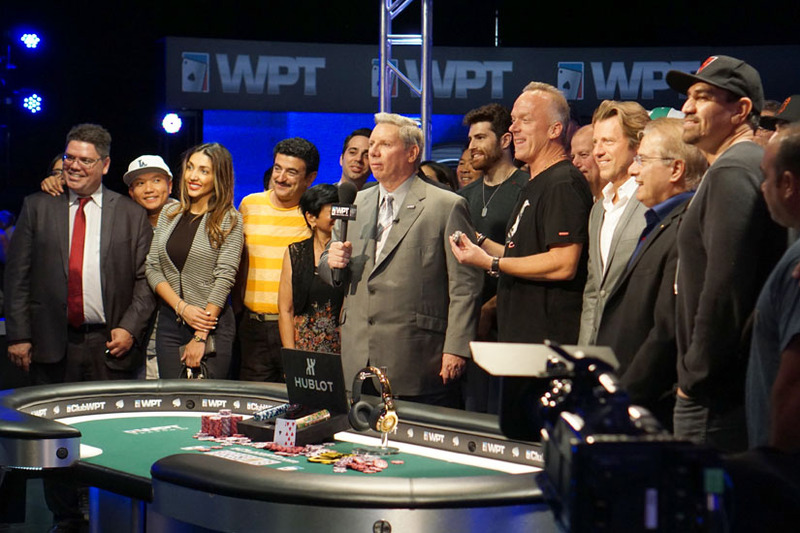 He went all-in pre-flop once again, and was called by Zamani's ace-two. The board didn't pair anything, so Lyons prevailed. 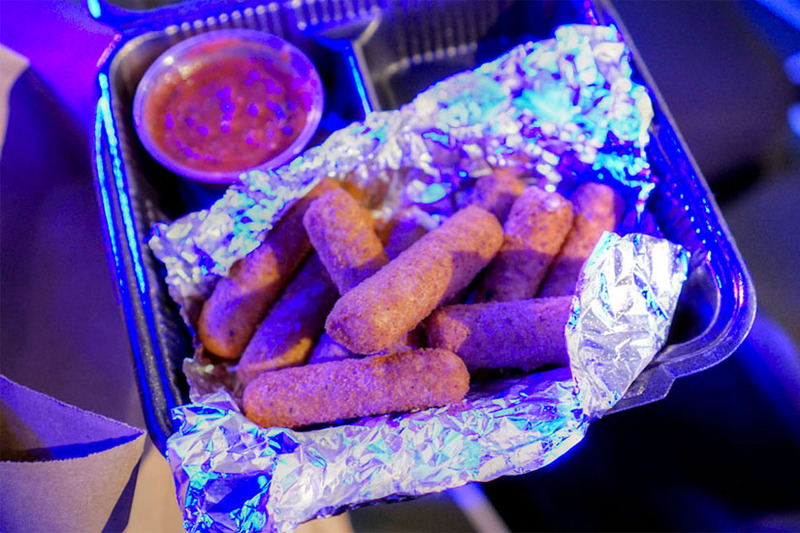 We needed some trashy eats to help soak up the alcohol, and ended up ordering mozzarella sticks and onion rings from Bike Brewery, the on-site restaurant. They did the trick. 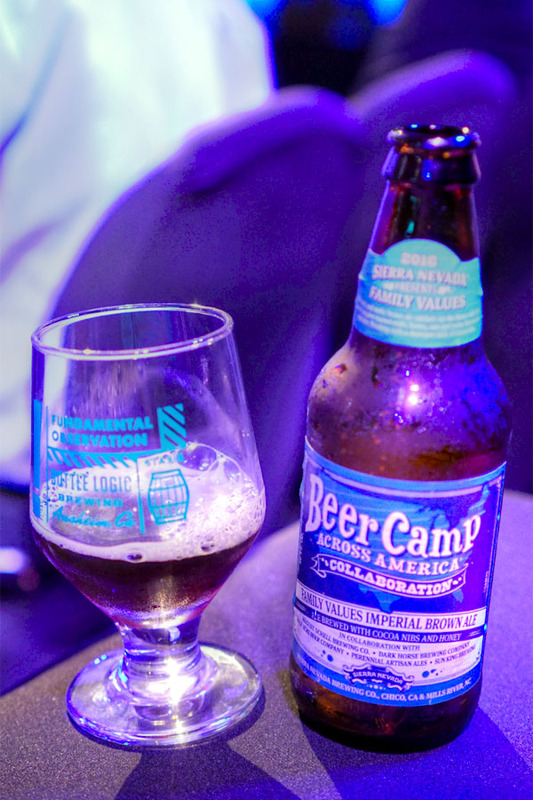 2016 Sierra Nevada Beer Camp Across America - Family Values: Created in collaboration with August Schell Brewing Co, Dark Horse Brewing Company, Half Acre Beer Company, Perennial Artisan Ales, and Sun King Brewing, this was an imperial brown ale with Illinois cocoa nibs and Indiana honey. Malt and honey on the nose, no question. The palate brought more nutty malt, more honey, and some roasty bitterness on the finish. 2016 Prairie Birthday Bomb! 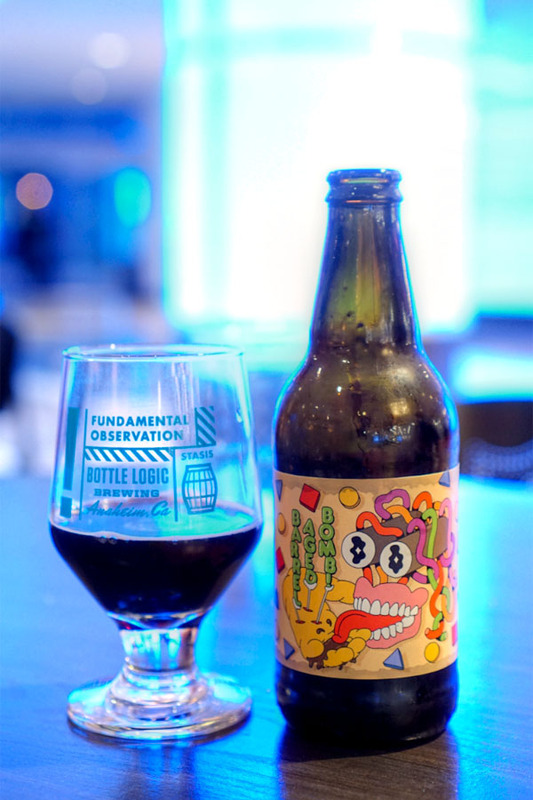 : An imperial stout aged on coffee, cacao nibs, vanilla beans, and chili peppers, but with ostensibly the inclusion of caramel sauce to celebrate the third anniversary of Prairie Bomb. Smelled smoky, astringent, with those unfortunate green pepper notes that often show up when coffee's involved. The taste was vegetal again, though this time joined by malt, roast, and the expected sweet spice. Not nearly as delicious as it should've been. 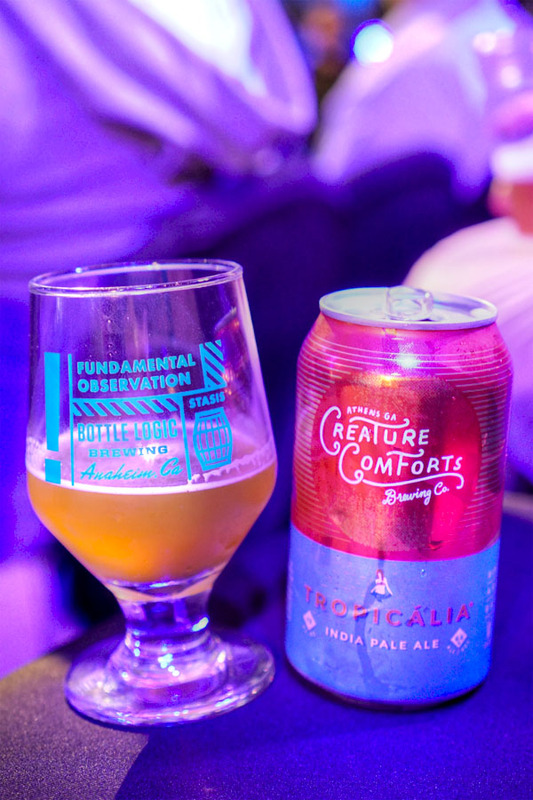 2016 Creature Comforts Tropicália: The lone IPA here. Aromas were full, rich, a mix of hops and sweet fruit. It didn't taste as good as I'd hoped for though, as I got a sharp, almost medicinal bitterness instead of the soft, juicy citrus flavors I'd expected. 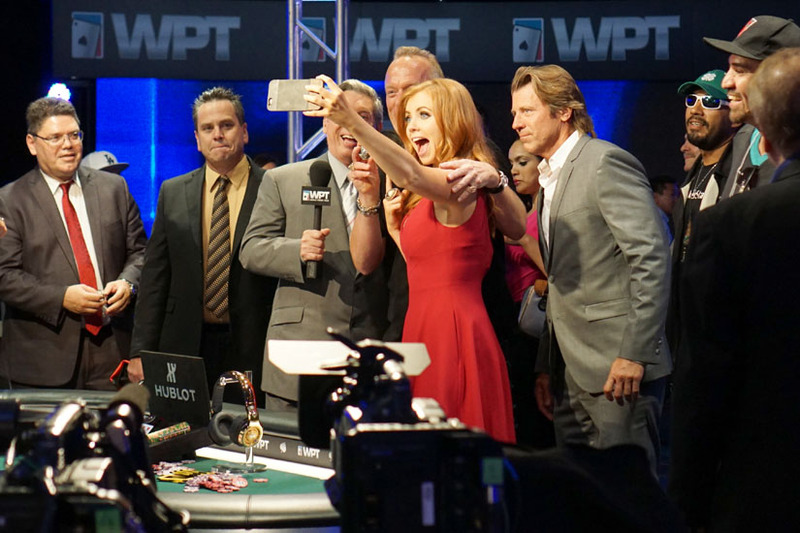 The night wrapped up with the prize presentation, a brief interview with Mike Sexton and Vince Van Patten, and an obligatory selfie with Lynn Gilmartin. With the filming done, we moseyed on over to the Coffee Bakery House and finished off our remaining bottles with our friend at the World Poker Tour. 2016 Prairie Barrel Aged Bomb! 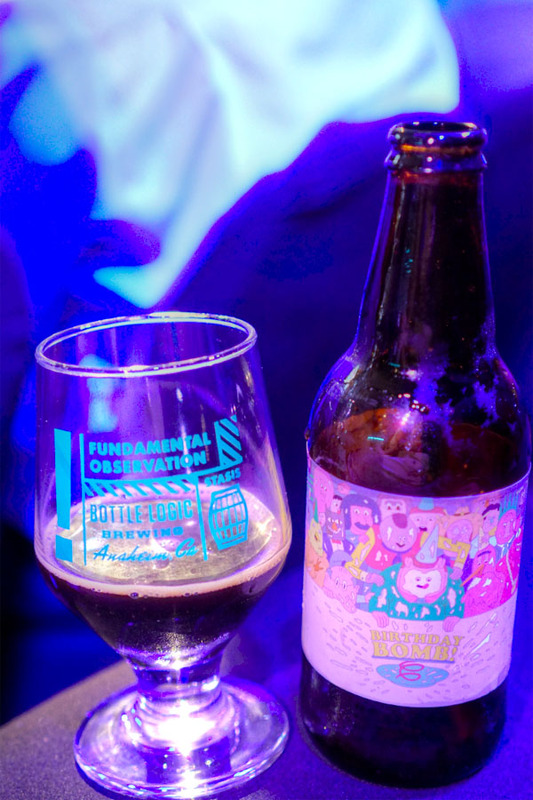 : An imperial stout aged in whiskey barrels with coffee, cacao nibs, vanilla beans, and chilies. Bouquet brought loads of dark fruit blended with malt and chocolate, while flavors were predominantly cocoa powder, spice, and oak. Better than the Birthday Bomb above for sure. 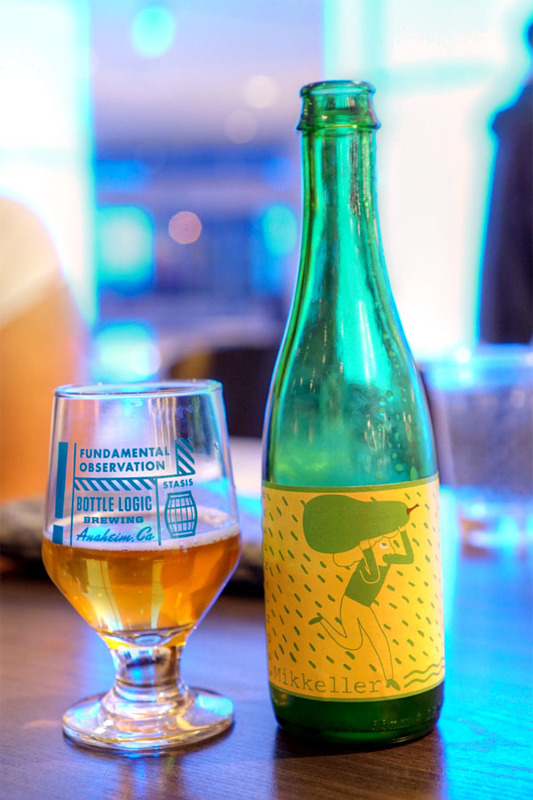 2016 Mikkeller Spontanpear: A lambic-style ale with pear. 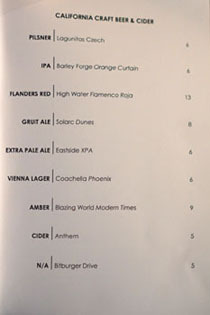 Somewhat surprisingly, I detected aromas of brioche and brown sugar along with the beer's general tartness. On the palate, I got the expected sourness, the expected earthiness, though not as much pear as I wanted. 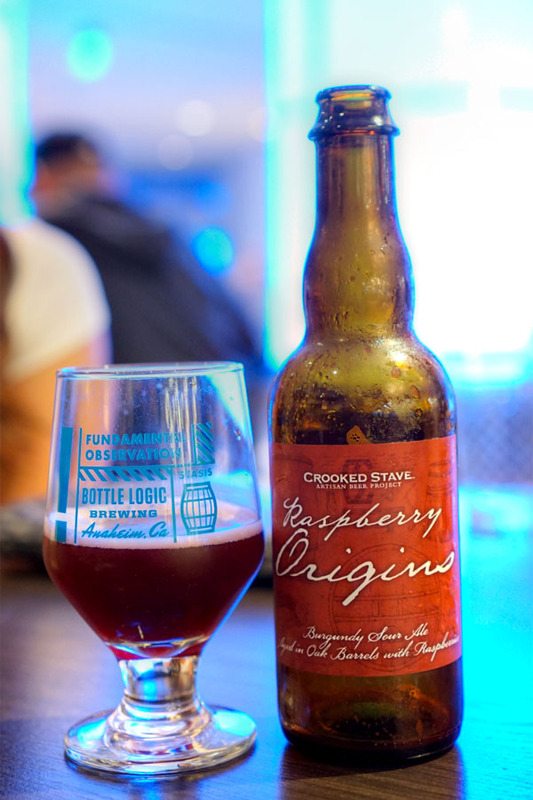 2016 Crooked Stave Raspberry Origins: A burgundy sour ale aged in oak barrels with raspberries. Tart, deep berry fruit on the nose--not bad. Flavors were again very fruity, sour, but with a strong oak presence. 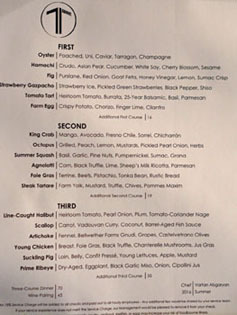 I've been twice now (review and 2nd review)and had (mostly) totally different dishes, great both times. You managed to pretty much have the stuff I missed too. There aren't very many exciting "non ethnic" places right now in LA and this is one of them. Glad to see that you enjoyed this unique restaurant as much as we did. Not a bad restaurant. Last time I was there, I had diarrhea and did quite a job on their toilet. Both my wife and girlfriend love this restaurant. Of course, they don't know about each other, so it's a nice touch when the restaurant doesn't blow your cover.